Nauvoo (/ˈnɔːvuː/; etymology: Hebrew: נָאווּ, Modern: Navu, Tiberian: Nâwû, “they are beautiful”) is a small city in Hancock County, Illinois, United States, on the Mississippi River near Fort Madison, Iowa. The population of Nauvoo was 1,149 at the 2010 census. Nauvoo attracts visitors for its historic importance and its religious significance to members of several groups: The Church of Jesus Christ of Latter-day Saints (LDS Church); the Community of Christ, formerly the Reorganized Church of Jesus Christ of Latter Day Saints (RLDS); other groups stemming from the Latter Day Saint movement; and the Icarians. The city and its immediate surrounding area are listed on the National Register of Historic Places as the Nauvoo Historic District. 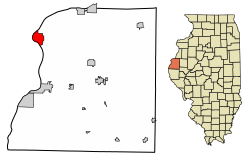 Location of Nauvoo in Hancock County, Illinois. The area of Nauvoo was first called Quashquema, named in honor of the Native American chief who headed a Sauk and Fox settlement numbering nearly 500 lodges. By 1827, white settlers had built cabins in the area. By 1829 this area of Hancock County had grown sufficiently so that a post office was needed and in 1832 the town, now called Venus, was one of the contenders for the new county seat. However, the honor was awarded to a nearby city, Carthage. In 1834 the name Venus was changed to Commerce because the settlers felt that the new name better suited their plans. In late 1839, arriving Mormons bought the small town of Commerce and in April 1840 it was renamed Nauvoo by Joseph Smith, who led the Latter Day Saints to Nauvoo to escape conflict with the state government in Missouri. The name Nauvoo is derived from the traditional Hebrew language with an anglicized spelling. 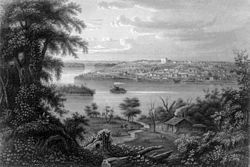 The word comes from Isaiah 52:7, “How beautiful upon the mountains...” It is notable that “by 1844 Nauvoo's population had swollen to 12,000, rivaling the size of Chicago” at the time. After Joseph Smith's death in 1844, continued violence from surrounding non-Mormons forced most Latter-Day Saints to leave Nauvoo. Most of these followers, led by Brigham Young, emigrated to the Great Salt Lake Valley. In 1849, Icarians moved to the Nauvoo area to implement a utopian socialist commune based on the ideals of French philosopher Étienne Cabet. The colony had over 500 members at its peak, but Cabet's death in 1856 led some members to leave this parent colony. In the early and mid 20th century Nauvoo was primarily a Roman Catholic town, and a plurality of the population today is Methodist or another Christian faith. On the city's higher ground are the temple, residential areas, and the business district along Mulholland Street (Illinois Route 96), much of it devoted to the needs of tourists and those interested in Latter Day Saint history. The flatlands are occupied by a small number of 19th-century brick houses and other buildings that have survived the city's vicissitudes, with large empty spaces between them where houses and whole neighborhoods have disappeared. Community of Christ owns much of the southern end of the flatlands and maintains several key historic sites in and around Nauvoo, including the Joseph Smith Homestead, the Nauvoo House, the Red Brick Store, the Mansion House, and the Smith Family Cemetery. Guided tours are available at the church's Joseph Smith Historic Site, at the south end of the town and accessible from Highway 96. The Church of Jesus Christ of Latter-day Saints owns most of the other historic sites in Nauvoo, including the homes of Brigham Young, Heber C. Kimball, and other early members of the church, as well as other significant buildings. Most of these sites are open to the public, with demonstrations and displays, and there are self-guided driving tours as well as wagon tours. These tours are free, as are the stage and riverside theatrical productions. There is a large visitors' center complete with two theaters and a relief map of 1846 Nauvoo. The creation of Nauvoo as a historical tourism destination was largely a result of the work of J. LeRoy Kimball (1901–1992). Kimball was a descendent of early Mormon leader Heber C. Kimball, and bought his ancestor's home in 1954 with the intention of restoring it. He was the president of Nauvoo Restoration, Inc. from 1962 to 1986. An LDS Church congregation was established in Nauvoo in 1956, from its inception consisting largely of elderly LDS couples serving as missionaries and historical guides. The City of Joseph Pageant, an outdoor musical produced by the LDS Church, began to run each summer in 1976. A stake was organized with headquarters at Nauvoo in 1979. In addition to the many homes that had been restored, the Relief Society Memorial Garden was dedicated in 1978, featuring statues designed by Dennis Smith and Florence Hansen. In June 2002, the LDS Church completed construction of a new temple on the site of the original temple. The exterior, and much of the interior, is a copy of the original. The exterior matches the original exactly except in three ways: The temple was positioned 12.5 feet (3.8 m) south to allow for parking on the north side, there are two new exterior doors (with an entrance on the north for disabled persons and emergency exits in the basement on the east) and there is a standing Angel Moroni as is seen on most modern temples; the original was an unspecified flying angel, also with a horn in hand but in a horizontal position with the compass, square and flame above. The rebuilding of the Nauvoo Temple was an occasion of great joy and enthusiasm for members of the LDS Church. During the public open house prior to its dedication, 331,849 visitors toured the building. Following Church custom, the temple is now used only by Church members. In comparison to other towns in the area, Nauvoo has seen consistent population growth since the completion of the temple. The work to renovate various sites of historical significance in the area is coordinated by Nauvoo Restoration, Incorporated. NRI is a nonprofit organization supported by the LDS Church and Community of Christ, as well as others interested in Nauvoo's history. Due to the work of NRI and its members, Nauvoo has been dubbed the “Williamsburg of the Midwest.” In March 2007, Nauvoo was nominated to compete as one of the Seven Wonders of Illinois. The LDS Church sponsors numerous activities throughout the year in Nauvoo including The Nauvoo Pageant (July/August), Grape Festival (Labor day weekend), and Pumpkin walk (October). Because most of the city is well above flood level, Nauvoo has not historically had problems when the Mississippi river has risen. 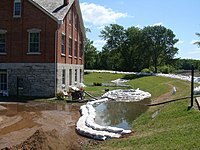 In both the floods of 1993 and 2008, very little damage was sustained within city limits. Nauvoo has many places of worship, among them: United Methodist Church, Christ Lutheran Church, St Peter & Paul Catholic Church, First Presbyterian Church, Cornerstone of Zion Church, Nauvoo Baptist Church, a Community of Christ congregation, and various Wards of the LDS Church. Nauvoo is at 40°33′N 91°22′W﻿ / ﻿40.550°N 91.367°W﻿ / 40.550; -91.367 (40.5446, −91.3803). Situated on a wide bend in the Mississippi River, Nauvoo has most of the historic district in the lower flat lands (called the flats) that are no more than a few feet above the water line. A prominent hill rises as one moves further east, at the apex of which stands the rebuilt Nauvoo Temple. Beginning with the temple, this elevated land (called the uptown) continues flat for many miles eastward. According to the 2010 census, Nauvoo has a total area of 4.831 square miles (12.51 km2), of which 3.39 square miles (8.78 km2) (or 70.17%) is land and 1.441 square miles (3.73 km2) (or 29.83%) is water. Non-census data indicates that the population of Nauvoo grew from 100 in 1839 to about 4000 in 1842, 12,000 in 1844, and stood at about 11,000 in 1845. As of the census of 2010, 1,149 people, 494 households, and 351 families resided in the city. The city's racial makeup was 97.7% White, 0.6% African American, 0.3% Native American, 0.6% from other races, and 0.9% from two or more races. Hispanic or Latino of any race were 1.60% of the population. There were 494 households, of which 20.0% had children under the age of 18, 60.9% were married couples living together, 7.7% had a female householder with no husband present and 28.9% were non-families. 28.9% of all households were made up of individuals and 12.5% had someone living alone who was 65 years of age or older. The average household size was 2.28 and the average family size was 2.70. In the city, the population was spread out with 19.9% under the age of 18 and 29.9% who were 65 years of age or older. The median age was 51.6 years. The population is 47.5% male and 52.5% female. The city's median household income was $37,216, and the median family income was $56,250. The city's per capita income was $26,210. About 6.6% of the population were below the poverty line, including 9.5% of those between ages 18 and 64, and 6.3% of those age 65 or over. As of the census of 2000, 1,063 people, 403 households, and 276 families resided in the city. The population density was 314.4 people per square mile (121.4/km²). There were 458 housing units at an average density of 135.4 per square mile (52.3/km²). The city's racial makeup was 97.08% White, 0.28% African American, 0.47% Native American, 0.19% Asian, 0.94% from other races, and 1.03% from two or more races. Hispanic or Latino of any race were 1.60% of the population. There were 403 households, of which 28.0% had children under the age of 18, 58.3% were married couples living together, 6.9% have a female householder with no husband present and 31.3% were non-families. 28.5% of all households were made up of individuals and 16.4% had someone living alone who was 65 years of age or older. The average household size was 2.46 and the average family size was 3.04. In the city, the population was spread out with 24.6% under the age of 18, 6.5% from 18 to 24, 21.9% from 25 to 44, 24.0% from 45 to 64, and 23.0% who were 65 years of age or older. The median age was 43 years. For every 100 females, there were 88.5 males. For every 100 females age 18 and over, there were 79.8 males. The city's median household income was $39,519, and the median family income was $49,167. Males had a median income of $37,895 versus $24,250 for females. The city's per capita income was $18,150. About 5.6% of families and 12.8% of the population were below the poverty line, including 16.2% of those under age 18 and 18.2% of those age 65 or over. The Nauvoo Blue Cheese company began to produce cheese in the 1930s. It was discovered that the cool, moist wine cellars in the area were ideal for aging cheese. The wine cellars, and the wine-making business originally started by the Icarians, saw a decline in use because of prohibition. In 2003 the Nauvoo Cheese company went out of business when Saputo food company purchased it and relocated to other facilities. Nauvoo is also home to Baxter's Vineyards, a small family-owned winery begun in 1857 by Emile Baxter that is it Illinois' oldest established winery. Tourism is the major industry in Nauvoo, with Nauvoo Restoration Inc., employing approximately 30, while an estimated 200 LDS missionaries (unpaid) also provide a boost to local businesses during the tourist season. Due to lack of sustainable industries, the city has lost several key businesses and services including the High School and multiple small businesses. In October 2018, a Dollar General opened in Nauvoo. Nauvoo City government consists of the Mayor, six aldermen (two from each ward), and City Treasurer. Additionally, there are appointed positions for City Clerk, Marshall, and Public Works positions. As of 2007, the mayor is John McCarty. The aldermen are Tom Adams, Clive Moon, Bev Reynolds, Jim Boyles, Dave Koechle, and Lee Ourth. Separate from the city are the Nauvoo Fire Protection District (FPD) and Nauvoo-Colusa School System. The Nauvoo FPD covers all of the city plus the surrounding five townships. The fire department currently provides both fire and EMS coverage for its district. In 1991 the Nauvoo FPD became a BLS non-transporting agency, relying on the county ambulance service to transport patients to local hospitals. Because of longer response times from county-run ambulances, the citizens of the Nauvoo FPD passed a referendum by 74% on April 17, 2007, for ambulance services that would transfer the ambulance tax money to the FPD that was being paid to the county. The Nauvoo FPD completed its fundraising efforts on November 30, 2007, to purchase its ambulance, which entered service in January 2008. The Nauvoo-Colusa Community Unit School District 325 runs the local elementary and junior high school. Prior to 2008 high school residents attended Nauvoo-Colusa High School from 1961 to 2008.. Since 2008 residents have attended Warsaw Community Unit School District 316's Warsaw High School. Nauvoo is also home to a private school Sts. Peter & Paul Catholic School which provides a faith based education for students in preschool through 7th grade. Brooks, Juanita (1962), John Doyle Lee, Zealot, Pioneer, Builder, Scapegoat, Glendale, California: Arthur H. Clark Co.
^ "2016 U.S. Gazetteer Files". United States Census Bureau. Archived from the original on December 3, 2017. Retrieved Jun 30, 2017. ^ a b "Population and Housing Unit Estimates". Archived from the original on May 29, 2017. Retrieved June 9, 2017. ^ "American Experience: The Mormon's". Act 3 - Persecution; Chapter 5. PBS Documentary. (2006) DVD, 240 minutes. ^ "Mormons begin exodus to Utah - Feb 10, 1846 - HISTORY.com". HISTORY.com. Retrieved May 10, 2018. ^ "Nauvoo, Illinois Religion". www.bestplaces.net. Retrieved May 10, 2018. ^ "DEATH: J. LEROY KIMBALL, M.D." October 20, 1992. Archived from the original on September 27, 2016. Retrieved September 24, 2016. ^ "Nauvoo Illinois Temple". Rick Satterfield. Archived from the original on June 15, 2013. Retrieved May 28, 2013. ^ "Nauvoo Churches". Historic Nauvoo Chamber of Commerce. Retrieved March 30, 2019. ^ "Archived copy". Archived from the original on August 22, 2017. Retrieved August 21, 2017. CS1 maint: Archived copy as title (link) Black, Susan Easton, "How Large Was the Population of Nauvoo?" ^ "Profile of General Population and Housing Characteristics: 2010". 2010 US Census. Archived from the original on March 5, 2014. Retrieved June 24, 2012. ^ "Selected Economic Characteristics". American Community Survey (ACS). Archived from the original on July 1, 2012. Retrieved June 24, 2012. ^ "Nauvoo Tourism office - Visitor information". Beautifulnauvoo.com. Archived from the original on September 27, 2016. Retrieved September 24, 2016. ^ "Dollar General in Nauvoo to open this month". Retrieved March 26, 2019. ^ "Nauvoo-Colusa High School". Illinois HS Glory Days. Retrieved March 17, 2019. ^ Vance, Diane (MVM News Network) (February 12, 2008). "Voters approve Warsaw/Nauvoo-Colusa deactivation plans". Hancock County Journal-Pilot. Archived from the original on June 3, 2017. Retrieved March 29, 2017. ^ "Sts. Peter & Paul Catholic School". Retrieved March 26, 2019. ^ Thomas Rees (January 1929). 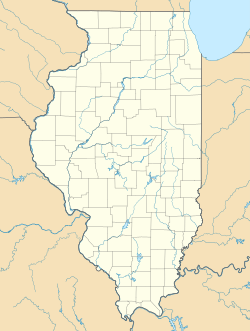 "Nauvoo, Illinois, under Mormon and Icarian Occupations". Journal of the Illinois State Historical Society. University of Illinois Press on behalf of the Illinois State Historical Society. 21: 506–524. JSTOR 40187583. Wikimedia Commons has media related to Nauvoo, Illinois. Historic Nauvoo – information on historic sites, demonstrations, and calendar of events. "Nauvoo" . Encyclopædia Britannica (11th ed.). 1911.